Pixieset is an awesome service that we utilize to seamlessly deliver your images to you! No more waiting on CD or USBs! Once the editing of your session is complete, we send you a link and 4-digit downloading pin customized for your online, personalized gallery. These galleries are also password protected. This link, 4-digit downloading pin, and password can be shared with any friends and family, and they will then have the ability to download the digital files as well! Don’t want anyone else downloading? Easy! Simply don’t share your 4-digit downloading pin! I have compiled a step-by-step tutorial below explaining how to view and download your digital files! To begin simply type or copy and paste the link provided to you into your browser. you will see one large cover photo with the name of your gallery on the image. Upon scrolling down, you will see your images, below the larger cover photo and gallery information. 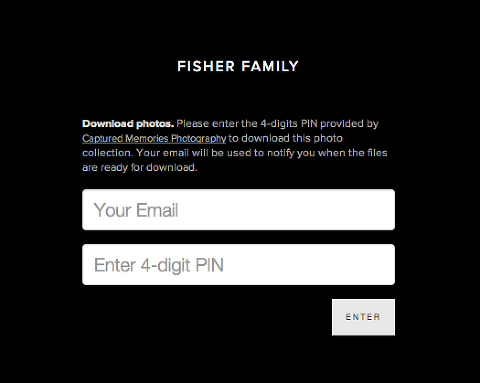 Once you click the download icon, you will be redirected to a screen and prompted to enter your email and the 4-digit pin you will have received with your personal gallery link. Simply enter your email and 4-digit pin. Your files will download as a “zipped” folder. If you have any more questions, please feel free to email us.